This is the free version of my donation based program Derp. It is limited in comparison to the donation version, but it is downsizable to the systray to tuck it away when you are not using it and works on both EU/NA. I offer no help, support, or lifetime to this program and donators get first priority to any updates on the paid version prior to this one being updated on patches, period. This program is provided as is. Virus scan results can be found here, it is obfuscated which will show as malware but is 100% clean and I of course, have always posted trusted programs. If you need to test the program, Process Explorer can be found here and you will see it makes no outbound connections ( though derp full does for login, you'll see it makes no other connection states after logging in ). Q: How can I get access to use the donator version of Derp? A: Donate a minimum of $5 and send me a private message containing the transaction ID, and an Username and Password that'd you would like to use for Derp, make sure to say it's a donation for Derp as I have other paid projects such as the one for Gw2. Q: When do I run Derp Lite? A: It doesn't matter, you can run Derp Lite before or after the game has launched. Q: None of the features is working, what can I do? A: Make sure you're running Derp Lite as admin, also Derp Lite doesn't support multi-boxing, only the donator version will. It does not work with steam or archebuddy because of the steam_api and the emulation archebuddy does with files. Also please note this only works with the dx9 version of the client. Q: Is Derp Lite safe from getting banned? Q: Does this support multi-boxing? A: No, only Derp Full does. Q: How can I get access to use Derp? A: You can click the $ symbol on Derp Lite to more quickly access it or scroll to the bottom of the page and donate a minimum of $5 and send me a private message containing the transaction ID, and an Username and Password that'd you would like to use for Derp, make sure to say it's a donation for Derp as I have other paid projects such as the one for GW2. Paying just for this does not grant you access to the Mod. Q: When do I run Derp? A: It doesn't matter, you can run Derp before or after the game has launched. A: Make sure you're running Derp as admin and have the latest .NET installed. Also please note this only works with the dx9 version of the client. Check the information icon once loading the program for further details. Q: Does Derp support multi-boxing? A: Yes but it does not allow you to choose which client ( work in progress ). Q: Is Derp safe from getting banned? A: You use Derp on your own risk, there's no guarantees that you won't be banned, you can get banned quickly if other players or GM's see you hacking. 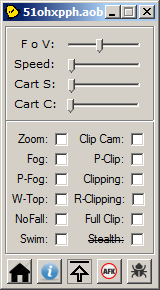 Q: What is Clip Cam? A: Clip cam allows you to swing your camera in a 360' angle without getting obscured by terrain/buildings/objects/ect cause it goes through it, like clipping but just for the camera. A: P-Clip allows you to player-clip through npc/players, meaning you don't have collision with them. A: Remove's fall damage in the game. Q: What is Tele Clip? A: Allows you to freely teleport inside of terrain. A: Shows your real hitbox ingame. A: Disables land & underwater fog, same as how the mod does, just with this you are able to toggle it more freely. This also removes the distance to see players fog, too. A: Removes the ocean surface. A: Allows you to swim fly hack to your heights desire or run across the ocean floor. A: Removes all models on the base tile that are not player owned. Q: What is Full Clipping? Q: What is Cart S & Cart C? A: Farm Cart Speed & Farm Cart Climb, allows you to control the speed & climb angle of the haulers. A: Allows you to control how fast you move/run/jump/glide and also your mount too. There is a full Readme included aswell as support to get it up and running and know that all of these features are optional and you are not required to use all of them. The mod is separate from the full version of derp but derp does things to compliment the mod. Q: Do you have anything for the private server? A: Yes, simply contact me via PM in relation to it. Q: How much do I donate for this? A: A simple donation of 5$ grants full access to either derp/mod/pserver, paying for one does not grant access to all as they are all separate. By you actively acquiring all of this, your also acquiring all future content updates to it and are welcome to test all of the tools being designed in relation to it and I take all of the users input into account ( granted its a bit hard as one person to squeeze in so much coding requests in one day, I do take notes ) and do the best I can to update and speedily put what is requested out for the users. Updates are included to all users and it is a lifetime access donation. When contacting me please say what it is in reference to, be it the mod or derp, and I will get you setup from there. Full technical support is offered for any problems/issues on everything for donators. Last edited by Ploxasarus; 05-15-2018 at 05:51 AM. thanks for sharing too, I would love to get more bots there. nice bot, hope to get more in the future. Hi, just donated for Derp and was wondering if anyone could tell when my username and password I chose wold be work? I have already sent an email with the transaction id . Any info would be appreciated. Since the revitalization of this forum, I've went ahead an updated all of the information in the main post of this thread to be more up-to-date. Everything is still working fine and completely maintained at the time of my posting here. can someone tell me what this programm can do in the free version ? Look at the main post, it obviously shows the picture an contents of the program aswell as what everything else does. You have skype or discordapp ? Is this tool still working? Was considering getting back into Archeage but want to have something to balance things in my favor while playing.